Hear the Radio Interview����Your browser does not currently support audio. Please update your browser. 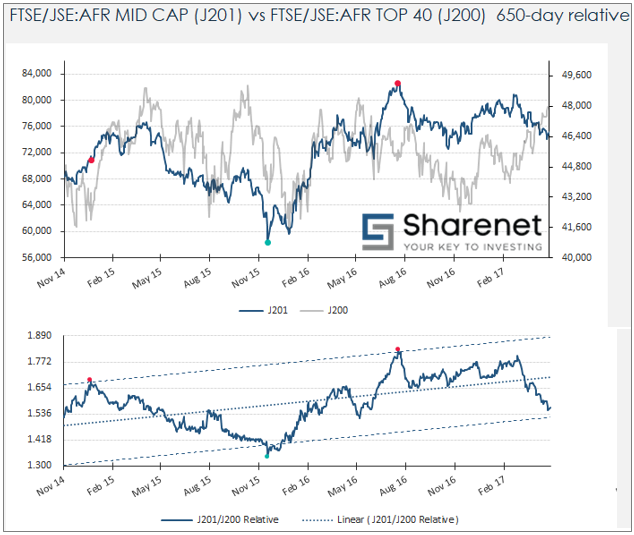 We look at various breadth metrics that spell danger ahead for the overall JSE index and examine some strategies to mitigate risk of potential correction. Market breadth, the analysis of how many shares in an index like the JSE are moving up or down, has been very poor lately, despite the JSE rising. This means only�a handful of large caps are propping up the JSE. Whilst these situations can persist, it is fairly accepted in international circles that this phenomenon is the hallmark of any self-respecting correction and market top. Let’s examine some breadth metrics to give you an idea of what we mean. PowerStocks Research subscribers, please note that all the charts below are updated every day in your ADVANCED CHARTS subscription. Just over 41% of the JSE’s 400 odd shares are trading above their 200-day moving averages. This breadth metric has declined from 60% against the backdrop of a rapidly rising JSE. So whilst a few large caps are in uptrends, the lion’s share of the stock market are in�downtrends. 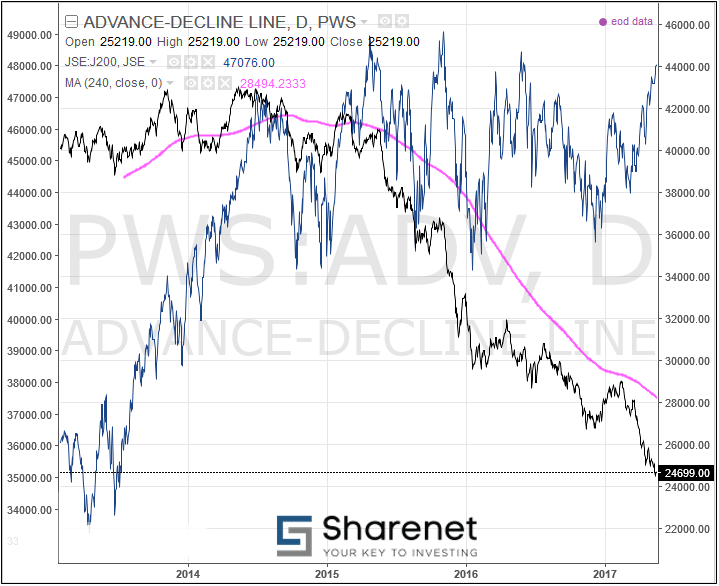 The perennial favorite, the Advance-Decline Line has been deteriorating since mid-2014, the time when we officially declared a bear market in SA stocks to our clients. 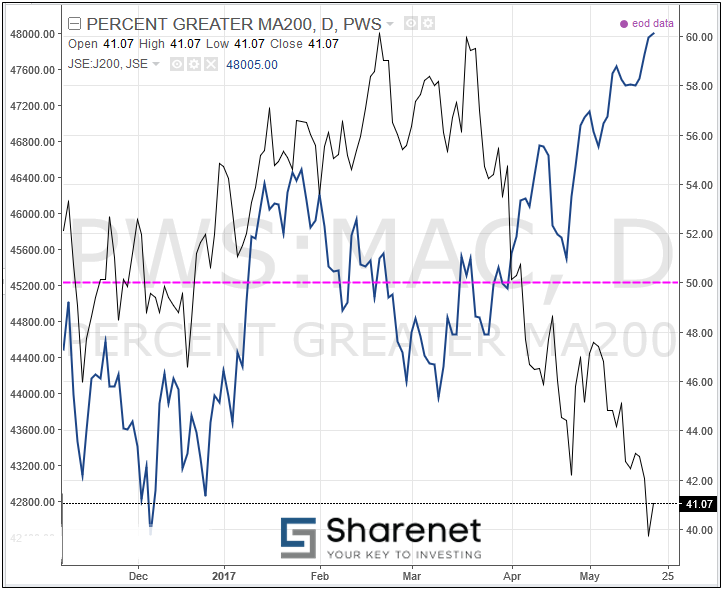 For a detailed VIEWS article on how this works and why it is so accurate the world over, see�Declining Market Breadth An Unhealthy Sign For JSE. 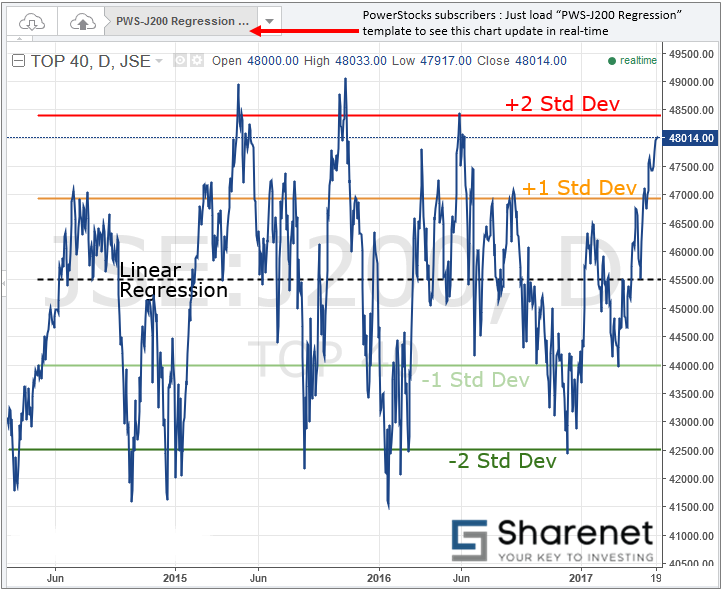 Despite a promising improvement off the back of the JSE rally that commenced in December 2016, the improving breadth petered out after the first big JSE correction in 2017, failing to breach the purple line demarcating a new bull market. The black line is falling rapidly, showing that more stocks are falling than rising, despite the JSE advancing strongly. This negative divergence is not healthy, and almost every time this happens the large caps propping up the JSE run out of steam, and with nothing holding it up, the JSE collapses. Here is another manifestation of weak breadth. 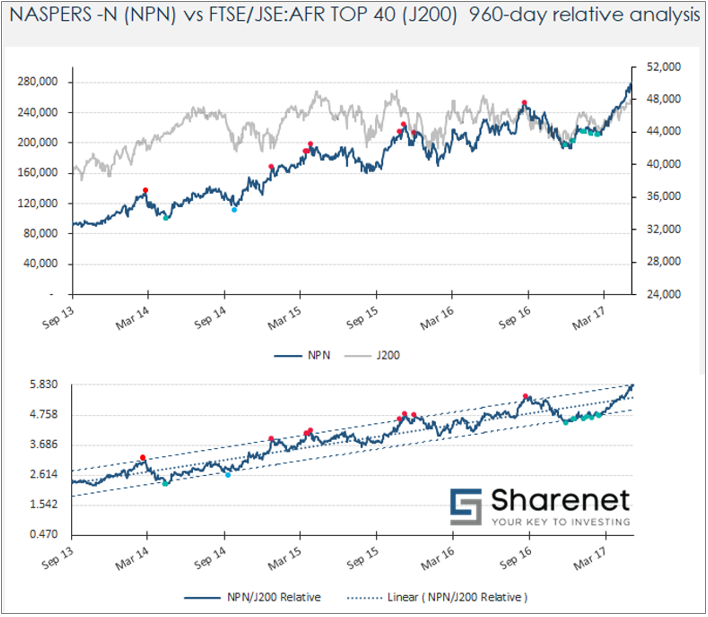 NASPERS:NPN is around 16% of the weighting of the TOP40. As such it is also the share in the TOP40 that is most correlated with the TOP40 index itself with a 0.784 correlation over the last year. For the last 4 years NPN’s share price relative to J200 (NPN divided by J200 price) has been well bounded by the +2 and -2 standard deviation limits. NPN’s price rise is now outpacing the J200 price rise to the point of�almost�+2 standard deviations. Whilst this is not an instant SELL signal for NPN (and the J200), it does mean caution is warranted, especially given that protection is so cheap now. 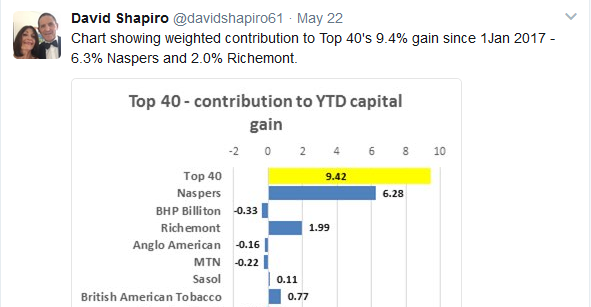 According to a recent Tweet from David Shapiro, NASPERS has contributed over two-thirds of the gains of the TOP40 since Jan 2017. The rest is rats and mice. So ask yourself - what happens when NASPERS runs out of headroom? It’s not only NASPERS that is stretched. Since March 2014, the J200 has entered a sideways pattern that is also well bounded by +/- 2 standard deviations from its mean. We are just 400 points shy of this as of 09H00 on 23rd May 2017. One more percent up and we are in rarified atmosphere again. If you are insistent on going long on something, then look for margin of safety. 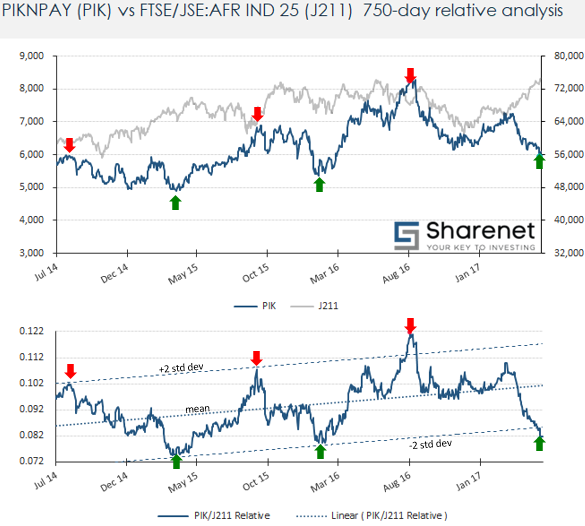 Here is an example we sent as an alert to PowerStocks subscribers this morning which shows PIK entering the kill zone for a potential long as it has heavily underperformed the Industrials.�Prior visitations by PIK/J211 to near the +2 or -2 std deviations yielded good outcomes over the last 3 years, both on the long and the short side of things. Wait for PIK to show decent technical analysis recovery signs before attempting longs though. Alternatively, go find refuge in the mid-caps which have been underperforming the large caps (TOP40) lately to the point where relatives are approaching -2 standard deviations. An expectation of the J200:TOP40 exceeding 48,500 means you are calling for a new 4-year paradigm with breakouts to new all-time highs with 48,500 the old resistance becoming the new support. Quite frankly the only way we are going to get there is if the Rand tanks and the large cap dual-listed counters rally in sympathy. Welcome to the stock pickers market. Dwaine van Vuuren is a full-time trader, global investor and stock-market researcher. His passion for numbers and keen research & analytic ability has helped grow RecessionALERT.com (US based) and PowerStocks Research into companies used by hundreds of hedge funds, brokerage firms, financial advisers and private investors around the world. An enthusiastic educator, he will have you trading and investing with confidence & discipline.